I was absolutely blown away by every aspect of the Apex Sports Yoga Stretch Strap! We have the return of Austin, who physically demonstrates the strap, but I have used it and I can tell you right out of the gate that I will be getting a few of these for a some family members … and of course a “replacement” for the one that Austin swiped from me. The Apex Sports Yoga Stretch Strap is more than just a stretch strap for yoga. I had my grandmother (who turned 75 on Friday) try it out. She is recovering from a serious foot issue and has not been able to do her three times per week workouts at the gym. Gran isn’t allowed to have weight on her foot and has been going a little stir crazy. With a person of her … a … years you have to be very careful not to loose flexibility and agility. This strap is perfect for her to stretch, as she doesn’t have to put any weight on her injured foot. The Apex Sports Yoga Stretch Strap is highly sturdy and Austin compares it to the material used at his job in industrial construction. The Apex Sports Yoga Stretch Strap isn’t just for yoga – it is perfect for Pilates, Physical Therapy Exercises, and Pre or Post Workout Stretching. 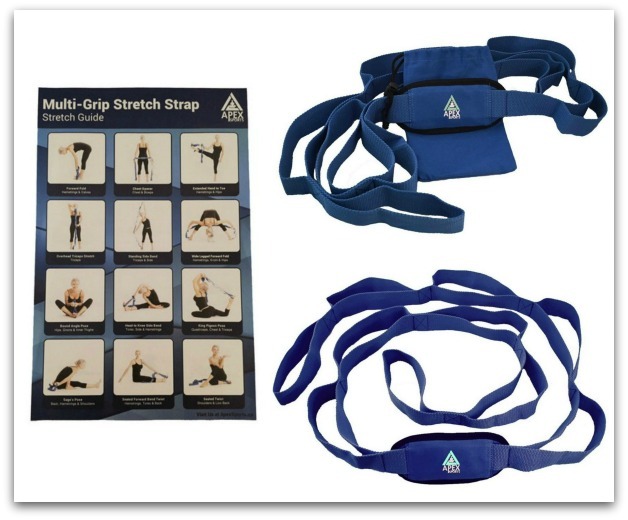 You can get your own Apex Sports Yoga Stretch Strap ($13.99) at Apex Sports.